Planning a wedding from abroad can’t be easy, but I do suspect that one of the rewards for people who undertake such a venture is seeing all their guests, who have also travelled from abroad, come together under one roof to celebrate their big day back home. Many of those guests might be in Ireland for the first time and will get to taste a bit of the local culture, and what better way to be exposed to it than an Irish wedding. I wonder, therefore, did Aislinn and Luke’s guests who had travelled from the UK and Canada leave their wedding at The Inn at Dromoland thinking that all Irish weddings featured singing waiters, or fantastic Irish dancers, or bread tables, or photo booths, or indeed lots of mingling time. In fairness, the Irish dancing probably wasn’t a huge surprise to many given that the bride’s mother runs an Irish dancing school in Co. Clare along with life-long friend of the family Daniel Flannagan – and the show put on by those dancers was indeed impressive (I’m qualified to judge, having done my own time learning my 1-2-3s in the later years of primary school more than a few years ago!). 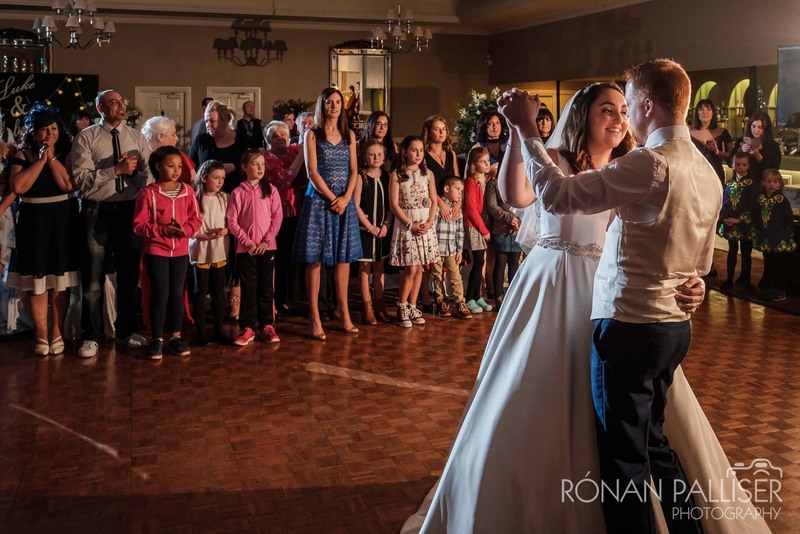 In fact Aislinn herself gave us a glimpse at her own Irish dancing talents, changing out of her wedding dress for the Irish dancing, and then back into it afterwards for the first dance – it’s a dedicated bride who opts to put the dress on twice in one day! Equally impressive was Marco, the Singing Waiter, who genuinely did surprise most of the guests, family included. He appeared towards the end of the main course and within 10 minutes had the room on their feet swinging their napkins over their heads. In fact the only thing I’d have changed about this wedding, in reality, was the rain that absolutely drenched us as we tried to catch a few brief bridal party photos near the lake overlooking Dromoland Castle. I thought for a while we were going to be lucky – as the receiving line proceeded at the church the rain started, but wasn’t too heavy, and Aislinn, Luke and their bridesmaids and groomsmen were happy to take shelter under umbrellas for the sake of a couple of photos in the grounds of the hotel. So we drove as close as we could to our chosen location and had to walk for the last two minutes. The rain stayed light, and the umbrellas did their job, but literally as I composed the first photo the wind picked up, and with it the rain and it became very clear very quickly we were going to have to make a dash for the shelter of the hotel. I think I literally got 6 frames, but they were productive ones and I’m grateful to Aislinn and Luke for sticking with it for the extra 30 seconds to allow me get two shots of the two of them in front of Dromoland Castle. We made up for it with a creative shot in the function room later were I brought together a few elements – a very cool photobooth wall that friends of theirs had made, with their names on it, the gorgeous chandeliers in the room itself, and a silhouette of the bride and groom. And what we lost in outdoor photos we gained in mingling time before dinner, allowing me to capture plenty of what was happening, alongside the numerous little personal touches that had gone into making the wedding their own. This was my first time at The Inn at Dromoland, but hopefully not my last – I loved the function room and the lobby areas of the hotel, and it presents lots of creative options even if the weather isn’t kind – that’s kind of the holy grail for a wedding venue – one that works with you even if the weather doesn’t as well as when the weather cooperates. Claire and all the staff were super friendly, too, which is always a welcome bonus. I finished up with the party well underway, and the British and Canadian guests in no doubt about how much fun an Irish wedding is.